It started out so well. 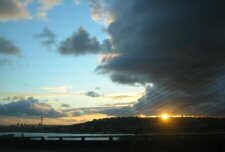 A beautiful sunset on the ship canal bridge coming into Seattle. 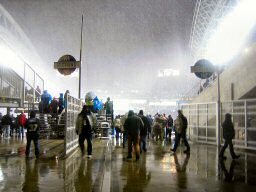 We were on our way to the Monday Night Football game between the Green Bay Packers and the Seattle Seahawks. Oh how decieving a pretty sunset can be! 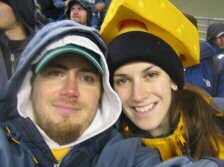 The game was awesome (even as a Packer fan! ), but the ride home was….not so good. We were at the game for 4 hours, 5:30-9:30 pm. We were in the car for 3 hours and 36 minutes to get home. And its only 23 miles… For more pics and more story, follow the jump! 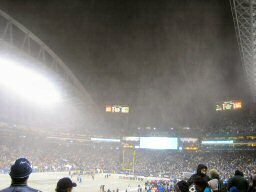 This is just before the half, just before Hasselbeck was sacked and fumbled and the pack recovered for a touchdown. 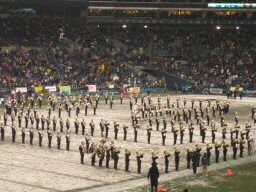 We could almost see the TV halftime show. The setup there was annoying, they had to cover everything from the snow. 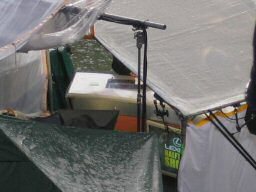 It only blocked our view during plays that went into the endzone. This was the view we had most of the game. 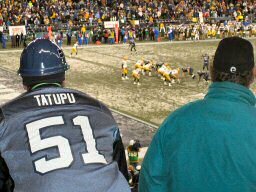 The Tatupu fan guy was tall, and yet for some reason he felt the need to stand the entire time. Even the Hawk fans near us were calling the guy names. Eventually, they got an usher to tell he guy to sit down. 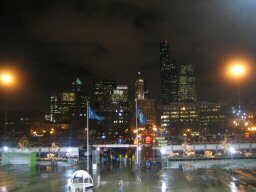 A great view of downtown seattle from inside Qwest field. The stadium district has some great views from the stadiums. During the 4th quarter, we had to get hot chocolate, as they stopped selling beer. Laura finished hers while waiting in line for a pretzel. The ‘hot’ chocolate wasn’t really hot. it was barely warm…. Ah, Brett Favre in the snow. Sadly, this was right near the end, where he was just throwing up anything, hoping for a gain. The first half was awesome, the 3rd quarter not too bad, that 4th quarter was just… well, classic Favre! So the game was awesome. Even with a GB loss, it was a great game. Lots of action, a great Driver touchdown right in front of us, a good comeback, some BFavre drama, a 40 carry, 201 yard day for Alexander, and one of our teams wins! What more can you ask for? The game was over right around 9, so we figured we’d be home in time to watch the news and see the highlights on TV. Yeah, it had snowed, but it hadn’t snowed that much. We got back to the car right about 9:30, and were ready to go. We listened to traffic and heard some reports, but all of the big problems they were talking about were either going south on I5, or were going north on 405… We really should have realized that when they were saying that northbound 405 was closed near our house, that maybe the night would be long. We ended up getting onto the express lanes, which were wide open from downtown going north. We got almost to northgate when we started hearing about horrible traffic at northgate, with some kind of accident or stalled cars or something. We saw one of those over the highway signs showing “Accident at Northgate” “2 left lanes blocked” “expect long delays”, but that sign was over the normal lanes, and the express lanes were still moving great. for about 1 more mile. As soon as we got close to Northgate, our 3 mile an hour trek began. All 5 lanes of traffic were stop (and wait, and wait) and go for 2 actual hours. We only went a few miles in that time. I5 was a skating rink. a horribly maintained skating rink at that. For a while, we were behind a sanding truck. But it didn’t do any good, because he wasn’t moving at all, so he couldn’t do anything either. At 11:30, laura had had enough driving, so we switched spots. At 11:45, we called a friend who lived nearby to see if we could stay the night at his house, because people calling in to the radio station were making it sound like traffic was going to be this way for hours, but we got no answer. We kept going north, slowly but surely. Between 145th and 175th, Laura counted 50 abandoned cars. And we’re not just talking “in the ditch” or “on the shoulder”. People were abandoning cars in the fast lane, in the slow lane, on exits, wherever they apparently felt like leaving them. Morons. We called AAA to find out where some hotels were nearby, but the number we had got some AAA office that was closed. Right around 175th, some people had called into KOMO to say that after 175th, it opened up and the roads were wet and slushy, not ice, so things would be a lot better. We really hoped so! Eventually we did reach that area, and it was just wet and slushy, and got up to about 20miles an hour on the highway. It took us about another hour to get to our exit. From 164th to Bothell Everett Highway, the roads were icy and snowy again, and most of that is downhill with stoplights. Every time a light ahead of us turned red i slowed down as best i could, but there was no way we’d be able to stop if we had to. Thankfully, all of the lights turned green again as we got there, so we just got to roll through them. Bothell Everett highway was worse than 164th. As we stopped for our left turn onto 180th, we slid on ice, but we stopped in time for the light. 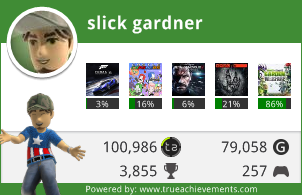 We were now on the final homestretch! 180th was packed snow and ice, with powder on top of that. Only one big hill to go down, and one big hill to go up, then it should be easy. the last mile was the worst! I was so nervous that after 3 and a half hours of driving i was going to ditch the car 1/4 mile from home! We got home fine though, we even got up the driveway and into the garage! All in all, it took us 3 hours, 36 minutes to travel 23.6 miles. Nice. 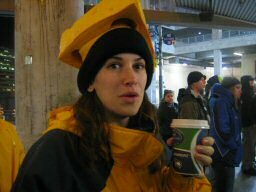 Got a sunburn at Lambeau! The whole world is against us? “one of our teams wins!”??? there’s no place for sports bigamy! what kind of a packer fan are you?